Acid Nitric 6—Racking noise during chewing, difficult hearing. Antim. Crud 6—Moist eruption behind the ears. Baryta Carb. 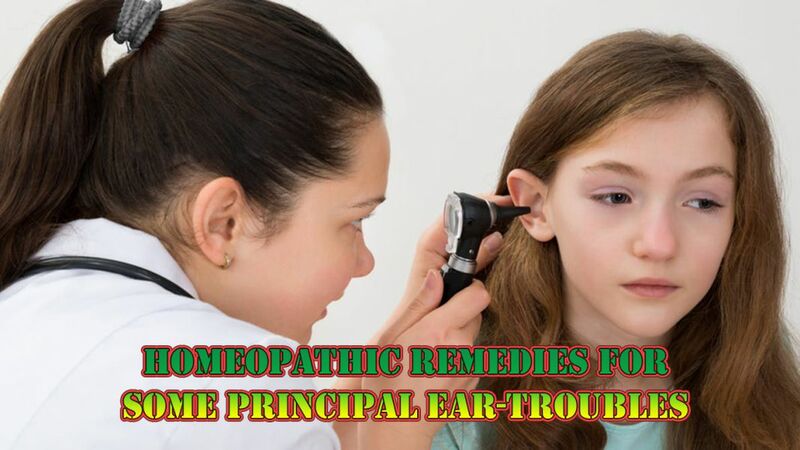 6—Hard of hearing; inflammation of glands around the ears. Belladonna 6—Inabiliy to hear high pitched notes. Calcarea Carb. 6—Purulent discharge, swelling of glands. China 3—Various sounds heard during attack of tinnitus. Kali Bichrom. 6 or Hepar Sulph. 6—Sore-throat and stitching sensation in the ears. Phytolacca 3x or Lachesis 6—Pain on swallowing.